1. Bonded Screw Caps With SeptaBonded caps are manufactured using a proprietary technique which effectively bonds the septa into the cap with no discernible increase in extractable outputs. Bonded Septa prevent blunt needles pushing septa into the vial and are recommended by some autosampler manufacturers. Bonded caps are manufactured using a proprietary technique which effectively bonds the septa into the cap with no discernible increase in extractable outputs. Bonded Septa prevent blunt needles pushing septa into the vial and are recommended by some autosampler manufacturers. 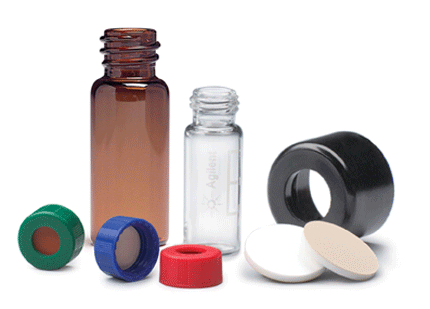 Finding suitability to be used over a wide temperature range spanning from -40°C to 200°C, these Vials Caps & Septa come extensively tested so as to perfectly match up with the end usage demands. Undergoing lab tests for ensuring defined quality standards, these are suitable for use with screw top vials as well as find compatibility with robotic samplers, thus providing support for almost all applications. Some of its features include providing for superior bonding support that eliminates chances of septa being pushed into vial, allows for easy needle penetration, offering re-sealable possibility and others.